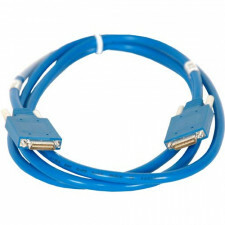 We carry more lengths and connector combinations of these DTE/DCE crossover cables so you have the right product for your frame relay simulation or CCIE lab setup. Choose from the newer style High Density Smart Serial connector or the older High Density Low-Force-Helix (LFH) 60-Pin connector or any combination thereof. Our cables are used by Fortune 500 companies, Government IT contractors, all levels of government, and educational facilities throughout the world.